BMW has introduced a limited run of ‘Frozen Silver Edition’ M3 Coupes, with just 100 examples available to UK customers to mark 40 years of BMW M GmBH. The M3 Frozen Silver Edition is priced at £58,720. To set it apart from the standard M3 Coupe, the limited edition features a Frozen Silver metallic paint, matt black alloy wheels, dark chrome exhaust, dark chrome exterior details, black bonnet intakes and a Shadowline exterior package. Black leather with contrast stitching, an alcantara steering wheel, carbon fibre details an M Power logos feature in the cabin, as does a limited edition plaque. 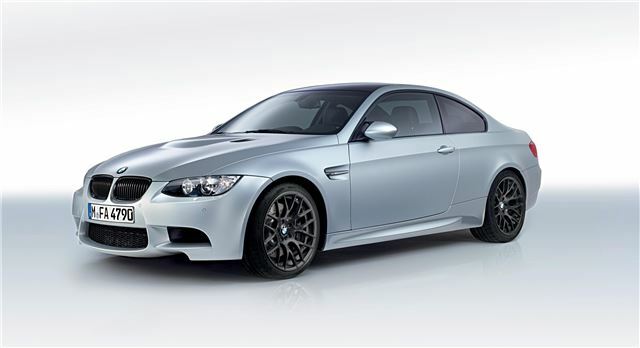 The M3 Frozen Silver is powered by a 420hp V8 linked to a seven speed DCT transmission. It sits 10mm lower on its 19-inch wheels than a standard M3 Coupe. The £58,720 price tag is £4000 higher than that of a standard M3 Coupe, but the Frozen Silver Edition comes with almost £9000 worth of extra equipment. It goes on sale on June 1st 2012.